The SAR built ninety-five of the 8300 class goods brakevans over an extended period from 1947 to 1972. The early vans (8300-8313) were readily distinguishable by the large louvre panels in the doors. 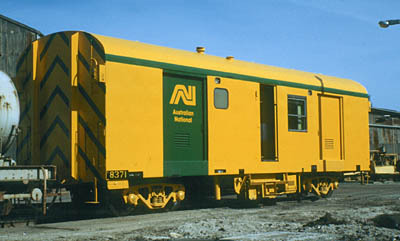 The subsequent vehicles conformed to a similar style, although minor differences were apparent between the 8314-8365 and 8366-8394 groups. 8366-8374 and 8393-8394 were issued to the standard gauge, all others were initially broad gauge. 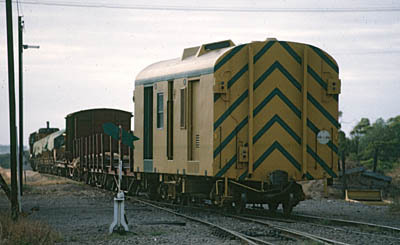 Four of the standard gauge vans (8366, 8368, 8371 and 8374) were converted to narrow gauge and sent to Port Lincoln in 1982 to replace the last of the wooden goods brakes. They were reclassified NVA1-NVA4 soon after their arrival, and again to the ENVA class in July 1985. 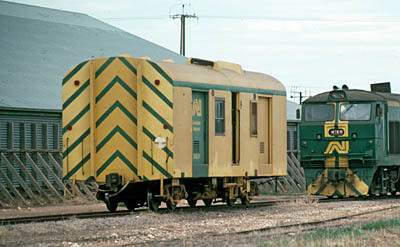 The 1968-built CGN brakevans for the Port Lincoln Division were of much smaller proportions, but similarities are apparent in some body components of contemporary 8300 class. 8366 / NVA1 / ENVA1. Built as standard gauge brake 8366 in 1966, stored until needed. To Port Lincoln (narrow gauge) 24 May 1982. Renumbered NVA1 2 Sep 1982. Renumbered ENVA1 5 Jul 1985. Condemned 13 Feb 1993, scrapped 10 Sep 1993. 8368 / NVA2 / ENVA2. Built as standard gauge brake 8368 in 1966, stored until needed. To Port Lincoln (narrow gauge) 26 May 1982. Renumbered NVA2 2 Sep 1982. Renumbered ENVA2 5 Jul 1985. Condemned 20 Aug 1988. Sold to Pichi Richi 20 Jan 1990. 8371 / NVA3 / ENVA3. Built as standard gauge brake 8371 in 1966, stored until needed. To Port Lincoln (narrow gauge) 18 May 1982. Renumbered NVA3 2 Sep 1982. Renumbered ENVA3 5 Jul 1985. Condemned 10 Nov 1990, sold 7 Jun 1991. 8374 / NVA4 / ENVA4. Built as standard gauge brake 8374 in 1966, stored until needed. To Port Lincoln (narrow gauge) 23 Jun 1982. Renumbered NVA4 2 Sep 1982. Renumbered ENVA4 5 Jul 1985. Condemned 13 Feb 1993, scrapped 10 Sep 1993.